When the motorbike is parked with a standard side position sometimes under the motorbike there is a wet one. After checking it turns out the gasoline drips from the carburetor. Why can it come out besin? it can be a float in the carburetor can not work optimally anymore to give pressure pressure, so that there is a gap in the gasoline continues to run and spill out of the air outlet. 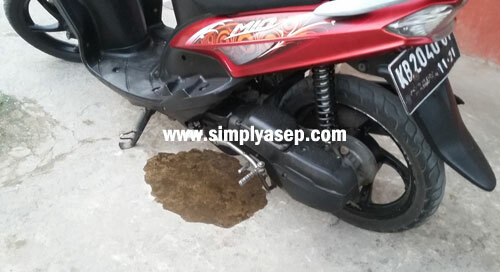 If the damage is not too severe, you can try it with a middle standard motorbike when it is parked. Because it can be a tilted position makes the aged buoyed can not put pressure on the spuyers. For this reason, a parallel position is needed to eliminate these obstacles. But when it is standardized in the middle, but the gasoline still drips out even more, for this reason it is necessary to replace the buoy, if possible at the same time with the spuyer, so that the performance of the carburator is optimal again.